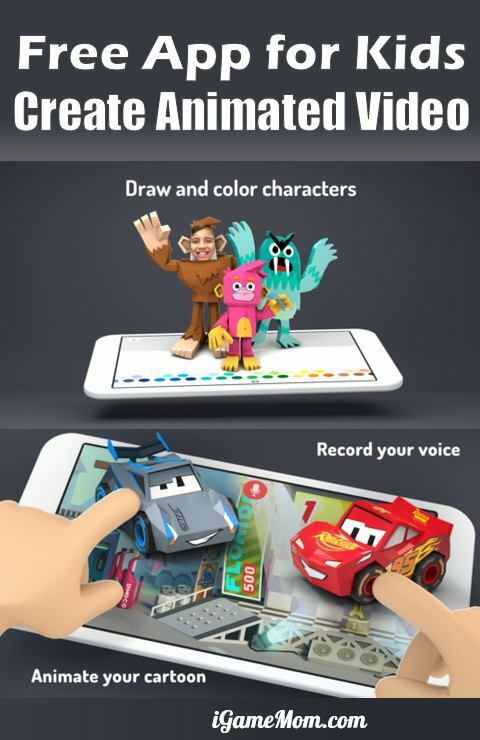 Toontastic is an app teaching kids storytelling by letting them make their own animated movies. Different from StoryKit and Educreation, the little figures in the app have moving parts – you will not only see the boy move around, you will see his legs move while he is walking. Another big difference between Toontastic and StoryKit or Educreation is that Toontastic provides guideline of story telling, and does it in a very fun way. When a child is ready to create a story, the app will show the “story arch”, the 5 steps of story telling: Setup, Conflict, Challenge, Climax, and Resolution. For each step, kids can choose the scene and characters the app provides, or they can make a scene and characters by drawing pictures of their own. They can also choose the background music from a list by the mood they want for the scene: friendly, happy, frustrated, sad, or other options. Similar to Educreation, kids can make movies by moving the characters around and providing story dialogues at the same time. They make one scene at a time, so it is not overwhelming at all. After the kids finish all scenes of the story, they can title the movie, add names for directors, and save their productions in the app, or share it with other kids around the world on ToonTube. It is a site that Toontastic hosts submitted movies created via the app. Kids have to get parental permission with a valid email address to be able to submit their movies. If your child wants to share his creation with the public, make sure don’t use his/her real name. Toontastic has found a very creative way to teach kids story telling. It is fun and engaging. Any kids above age 3 should be able to enjoy the app. It is not only a creative tool for kids, parents and teachers can use it to create teaching stories too, be it about math or social studies. For more storytelling apps, please visit Best Storytelling Learning Tools for Kids. It does seem they took it off the app store. But I highly recommend Toontastic. I am sure you will love it. Thanks for highlighting this app, very timely as I need to do some social stories for children, on how to play with others . Pity it is not available on android but will check out the other apps you have mentioned. Educreation doesn’t have Android app neither. However, you can create course on the website. I’d like to be able to run these apps for my kids and my grandkids, but don’t particularly want to be able to access the internet on my phone, etc. What platform would you suggest? Cheaper is better, of course, but not to the point that it interferes with the function. You will not be able to download the app unless the phone has access to the Internet. If it is safety you are after for your kids and grandkids then try to see if your phone already has a “Kidzone” built in to the system. I have an older T-mobile smartphone and it had software already installed that prevents my children from accessing the internet but allows them to play games I have downloaded for them. And another caveat to the kidzone, you might have to set it up so that they cannot access the internet, plus, if an app has an ad free version then you should go with that so that the kids don’t inadvertently hit a link that takes them online to some sort of app store. I hope this helps. If you are looking for suggestions for devices to run apps on instead of a smartphone then the Kindle Fire, the Nook, any tablet devices along those lines would work great as well. Thanks for helping explain the scenarios.